Dental Cavities in Children – How Common Is It? 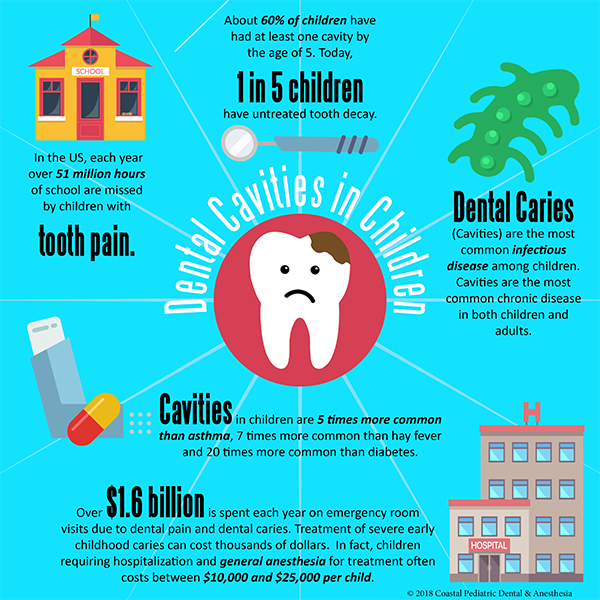 Dental caries, also called cavities, is the most common infectious disease in children. It is also the most common chronic disease in both children and adults. As a parent you are not alone if you are shocked or in disbelief when told that your child has untreated tooth decay or cavities. Most children have had a cavity and it is nothing to be ashamed of. The important thing is to treat that cavity and learn appropriate ways of preventing further decay. Dental caries or cavities are caused by bacteria in the mouth that eat sugars and turn them into acid. This acid dissolves the tooth structure creating holes or cavities. When a child is born, their mouth does not have any of these bacteria. However, the bacteria is introduced through contact with parents and the environment. Usually it is the mother and father that first “innoculate” or give this bacteria to their child. Therefore, the first step to preventing dental cavities in children is the parents taking care of their own teeth and mouths. Dental caries is a chronic disease. Once decay has formed, it does not just go away. Even after a filling, the disease still remains, but the tooth is repaired with dental material. Treating the decay is important because it prevents cavities from getting worse. How Common are Dental Cavities in Children?